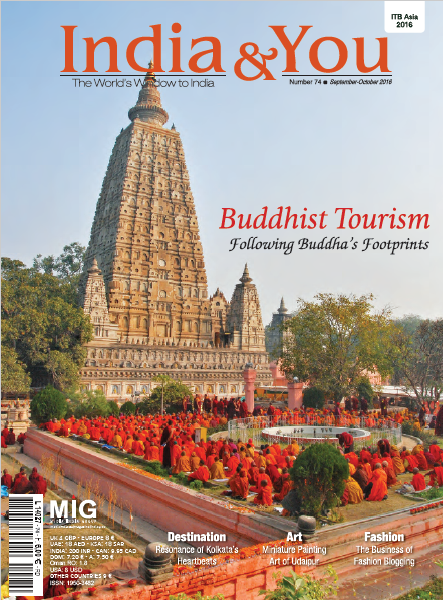 The tourism and hospitality industry has been affected by the insurgency in the northern Indian state of Jammu & Kashmir over the past two and a half decades and still faces uncertainty. R K Sarovar Portico chain, however, that opened its branch four years ago in the state’s summer capital, Srinagar, enjoyed 73 pc year-round occupancy in 2015, thanks to its location, services, modern amenities and inherent Kashmiri hospitality. Emerging out of the airport and entering Srinagar, the summer capital of the northern Indian state of Jammu & Kashmir, one may notice the presence of the CPRF (Central Reserve Police Force) a little more than in any other city of India to get intimidated. Quite conversely to the popular notion of the ‘paradise on earth’, the city that rests amidst insurgency and was badly affected by the flood in 2014. But as you cross this, through the isolated and beautiful lanes bordered by the popular deciduous chinar trees of the region on both sides of the road, you gain the glimpses of the ‘paradise’ and understand why Kashmir touristic potential is huge and still largely untapped (read box). It is here, about half a kilometre away from the beautiful Dal Lake, with its colourful houseboats, that R K Sarovar Portico hotel is located on a hillock. Amongst the third largest hotel chains in India, Portico’s Srinagar property is surrounded by the snow-clad Himalayan Mountains. It is amongst the only two international level brands in Srinagar, the other one being the luxury chain Taj. The beautiful locale of the hotel in the Srinagar Valley offers a stunning view of the city as you climb the stairs to enter the reception area. 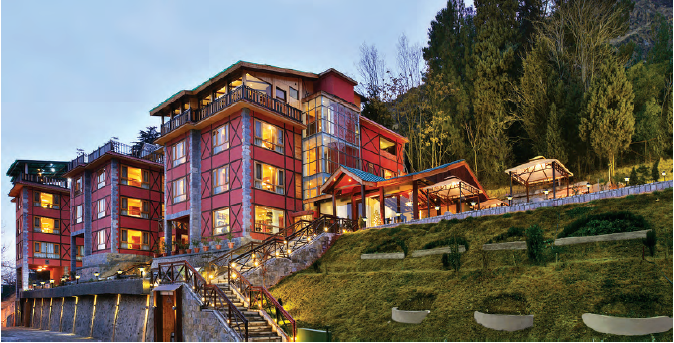 The property has won awards in the category “Best Mid-Segment Hotel” in Kashmir for the past two years. 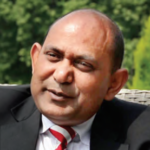 In the last three years of his assumption of the post as general manager, Shafiul Alam Ishaque has promoted the property amongst the corporate clients achieving 73 pc year-round occupancy. Reaching there, in the centrally heated guest rooms (in response to the cold climate of the region), one can rest and enjoy the Kashmiri hospitality that comes naturally to the staff. As says Ishaque who has been in the hospitality industry for over 15 years across the country, “Culturally the Kashmiris are very welcoming and hospitality is inherent to them from homes. They don’t have to go to any management school to learn that.” Each of the staff, for instance, greets you with a smile when you cross path. Of the 52 well-equipped, wooden floored rooms with modern amenities, there are three executive suites and rest superior rooms. The executive suites, apart from offering the beautiful view of the valley from a personal terrace, accommodate a living room and an elaborate bathroom. But it comes with a price of INR 14,500, with additional complementary services such as airport pick and drop, mini bar and free usage of boardroom beside the general services like free wi-fi that are available to all guests. The rest 49 superior rooms have tariff – between INR 9,500- 10,500 – depending on the single or double occupancy. The hotel has two restaurants – Takht-E-Suliaman and Sheesha – to choose from. Takht-E-Suliaman, headed by Chef Abas Bhat, is an all-day multi-cuisine restaurant with an obvious focus on Kashmiri food. However, they don’t have every food item listed on their menu and one must take the recommendation of the waiters to enjoy the authentic Kashmiri cuisine prepared under the guidance of Chef Abas Bhat who has worked across India in esteemed brands like Taj before coming back to his homeland three years ago. While Kashmir is famous for its elaborate non-vegetarian options, specifically lamb and mutton preparations, vegetarian dishes like nadru yakhni (lotus stem preparation in yogurt) and haak (spinach like leaves) are specific to the region and something that the chef masters at. The ambience is well decorated with wooden ceiling and flooring and offers a stunning view of the surrounding through its big glass walls. Metal sculptures of traditional utensils like samovar (to make ‘noone chai’ or salty tea), intelligently placed at the entrance, not only decorates the space but also generates curiosity. While Takht-E-Suliaman is an active restaurant, Sheesha is more laidback. Placed next to the reception, it is an al fresco café that also serves hookah (instrument for vapourizing and smoking flavoured tobacco) that one can enjoy on a rainy day or the cold environs of Srinagar along with traditional kahwa (hot Kashmiri beverage prepared using saffron and almonds). For meetings or events one can also take advantage of the banquet hall that can accommodate a cluster of 70-80 people apart from a boardroom for 12 people. Every morning the Sarovar Portico team, headed by Ishaque, sits at the boardroom to discuss the day’s agenda. The hotel is also planning to open a spa that it will outsource for the guests. It will only add to the relaxation that the clients feel amidst the beautiful environ, lovely weather and the immaculate Kashmiri hospitality. How do you see tourism in the near future in Kashmir? I expect the volume to rise as when I compare Kashmir with the neighbouring state of Himachal Pradesh, we don’t even get 12 pc of the tourists that they get, although Kashmir has an immense tourism potential. As this is a valley, in contrast to the popular myth of it being a hill, it is easier to travel for a longer period. People travel 100 kilometres to places like Pehelgam mountain resort and come back with no fatigue because of the weather and no pollution. In the coming years, if media doesn’t play a spoil game, then we look forward to receiving huge clients. We are expecting this part to get connected by the railways to other parts of India by 2019. Once that happens the tourism will increase. What are the unexplored places in Kashmir? Normally when people come here, they restrict themselves to Srinagar, and mountain resorts such as Pehelgam, Sonmarg and Gulmarg. However, there are more beautiful places in Kashmir such as Ganderbal (on the way to Sonmarg) and Wular Lake in Bandipore district. There is a place called Aharbal, in the Shopian district, to which the drive is very beautiful; the only noise you get is of water and it appears you have crossed three mountains to get there. The drive from Sonmarg to Kargil is also very scenic. And it is very much accessible for the civilians. From Srinagar it’s a 5-6 hour drive. There is peace, greenery and no pollution – for corporate it is the idle place to come. In terms of overseas, specifically the European clientele, what are the prospects? Due to the political scenario, people from the first world are asked not to travel to this part. The tourism from overseas is still very low. But if you talk about domestic tourists, India is a large country with 1.25 billion people and even if one percent of that comes to Kashmir, I would be more than happy.